This entry was posted in InTune Artist News and tagged Billboard, Brazil, Chris Weaver Band, Sorocaba on May 22, 2015 by InTuneAdmin. (By Chuck Dauphin – Billboard.com) As a relatively new artist, Chris Weaver has spent a lot of time on the road in the United States getting acquainted with fans and radio programmers. However, this spring, the West Virginia native took his music on the road like never before — all the way to Sao Paulo, Brazil. This entry was posted in InTune Artist News and tagged American Dreamer, Chris Weaver Band, Independent Artist of the Year, Music Row on February 26, 2015 by InTuneAdmin. I love a good wiseacre. “I’ve been trying to pay off radio with beer and Jack Daniels for four years, and it finally paid off,” said snarky Chris Weaver. He has a charmingly mischievous grin that makes him look like he’s up to something, even if he isn’t. 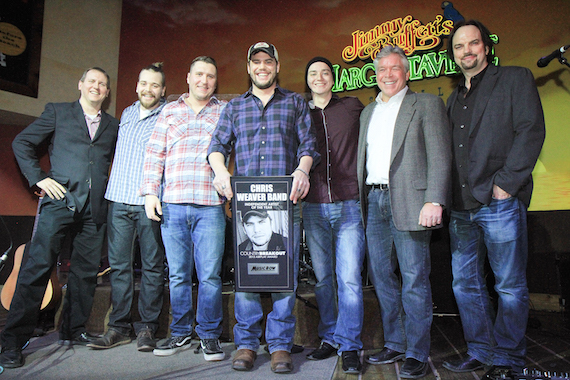 He was accepting MusicRow’s Independent Artist of the Year award for The Chris Weaver Band at the periodical’s 13th annual CRS bash on Wednesday (Feb. 25). I’ve always enjoyed this act’s music, and now I totally enjoy its frontman, too. Thanks, pal, for kicking off my convention experience with a grin. Waylon Weatherholt and Katie Bright accepted on behalf of Cole Swindell, MusicRow’s Breakout Artist winner, who was booked for a private out-of-town date. Vice President of Promotion Shane Allen accepted for Capitol Records Nashville as Label of the Year (winning for an unprecedented 10th consecutive time). Jimmy Rector accepted Eric Church’s Male Vocalist award because proud papa Church is at home with new son Hawk this week. R.G. Jones accepted for Female winner Miranda Lambert (her third in a row). Matthew Hargis accepted for Group/Duo winners Florida Georgia Line, who were busy playing a little venue called Madison Square Garden. MR’s Sherod Robertson presided at the afternoon get-together. “We’re tired of the cold, but we’re glad you’re here,” he told the shoulder-to-shoulder crowd. “You’re looking good,” he added, taking a snapshot of the packed room. Staffers Troy Stephenson, Sarah Skates, Jessica Nicholson, Eric T. Parker and Kelsey Grady kept the event running smoothly. Music is always a big part of this annual awards-and-music occasion. First up to sing was BBR’s Red Bow Records artist Chase Bryant, who tours with Tim McGraw. This Texas native is the grandson of a Roy Orbison/Waylon Jennings piano player and the nephew of the co-founders of Ricochet. Bryant opened with the take-no-prisoners steamroller “Little Bit of You.” He led his four-piece band as its lead guitar player, which was on full display via a stinging solo on the power stomper “The Way I See It.” He followed that with his catchy first hit, “Take It On Back,” featuring an extended electric-guitar finale at the edge of the stage. “Thank you to everybody in this room for making a kid from a small town of 800 people have a dream come true,” he said. “It’s so nice to see so many nice faces,” said showcasing Austin Webb. The tall, tattooed, Streamsound Records artist led off with the rhythmic and hooky “If You See Her.” He then strapped on his acoustic guitar to augment his four-piece band. This guitar has signed photos of Kris Kristofferson and Guy Clark affixed to its back, which seemed appropriate for the philosophical “Slip On By.” Webb concluded with his new single, the rousing and clever “All Country On You.” Everyone clapped along. This jammed room is a hard one to work. But I spotted industry mavens including Byron Gallimore, Bill Wence, Nancy Tunick, Mark Brown, Neil Spielberg, Rod Essig, Woody Bomar, Gene Kennedy, Wes Vause, Karen Tallier, Steve Pope, Rick Kelly, Earle Simmons, B.J. Hill, Lisa Smoot, Susan Collier, Bev Moser and John Dorris in the house. Most were grooving to the cool sounds on stage. Several non-showcasing artists were working the room. Eric Lee Beddingfield, Jason Michael Carroll, Jody Lynn, Tracy Lawrence, Eileen Carey, The Cains Trio, Montana’s Kayla Adams and 16-year-old Texan Skylar Elise were schmoozing the radio folks. And off we go into the full CRS extravaganza.